Kids who have outgrown their car seats are not quite ready for a seat belt alone although they might try to convince you otherwise. Instead, have them transition to a booster seat that enables the adult seat belt to fit properly. Booster seats can actually be pretty cool. Best of all, children 4 to 8 years old seated in a booster seat in the back seat of the car are 45% less likely to be injured in a crash than children using a seat belt alone. Choosing the right car seat is high on the list for any new parent, and every parent plans to leave the hospital with a newborn securely buckled up in a car seat. But as kids grow up, using a car seat or booster seat may feel more like an option rather than a requirement. In California, just remember it’s the law. All children who are under age 8 must be properly buckled into a car seat or booster in the back seat. Children 8 or older, or who are 57″ tall, may use the vehicle seat belt if it fits properly with the lap belt low on the hips, touching the upper thighs, and the seat belt crossing the center of the chest. Booster seats are not installed the same way car seats are; a booster seat uses no harness. They sit on the vehicle seat and are used to properly position the adult seat belt for an older child. Never place the shoulder belt under the child’s arm or behind the child’s back. It is against California law. Tell all drivers who transport your bigger child that booster seat or car seat use is a must when your child is in their vehicle. 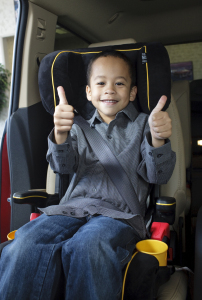 When your child reaches 4 feet 9 inches, use the Safety Belt Fit Test to determine if the child is big enough to use the adult seat belt without a booster. Use the Safety Belt Fit Test on every child under 13.